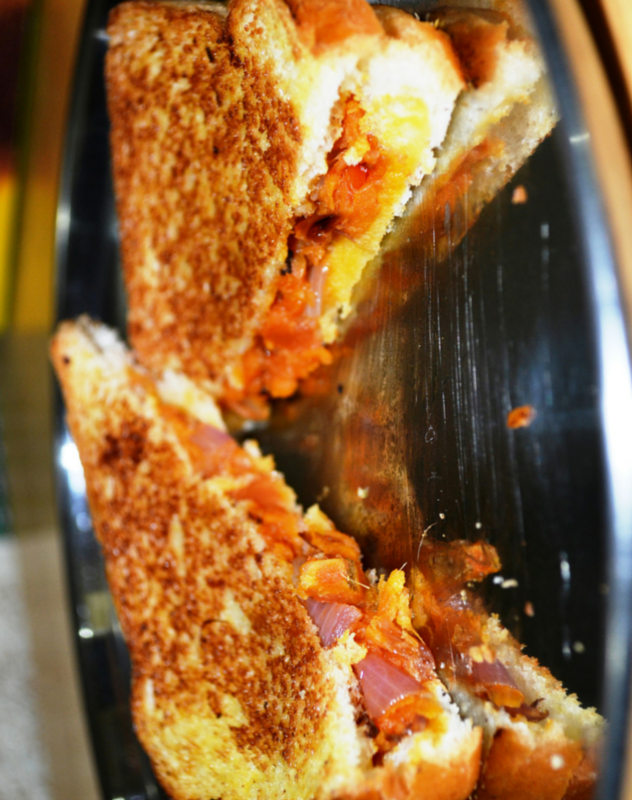 We are delighted to feature an easy but yet a delicious recipe; vegetables stuffed sandwich from Anitha who blogs over at gofoodieworld. She shares many enticing and delicious recipes on her blog and I bet you will find her blog interesting once you check it out. 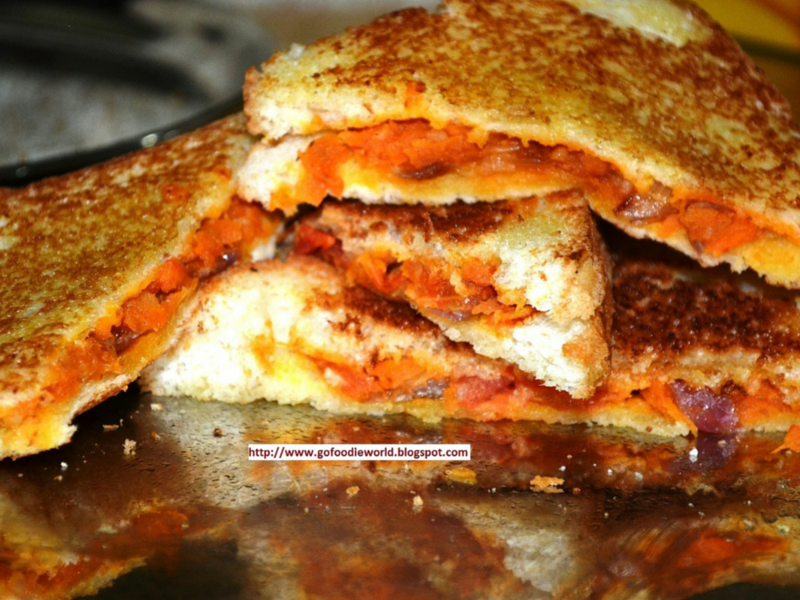 Here is her recipe for this vegetables stuffed sandwich and I hope you enjoy it. 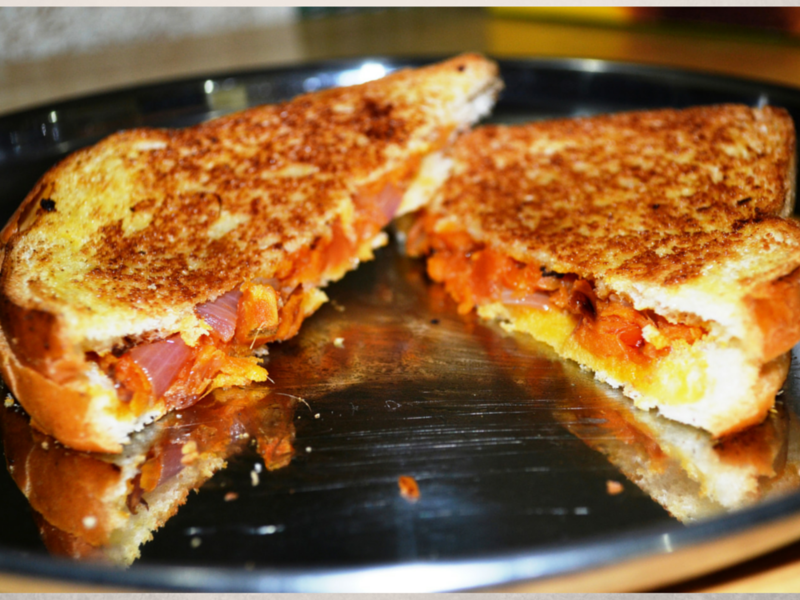 This post features an appetizing snack for your breakfast and I bet you will enjoy it as well. This is a very quick recipe when you have boiled potatoes in hand. If you are looking for kid’s favorite for lunch box here is the one for you! It could be served for breakfast or enjoy it as evening snack. The stuffing can also be your leftover curries, add some onions and tomatoes to make it yummier. Boil potato. Peel and mash it and keep aside. Heat oil in a non-stick pan, add onion, ginger paste and sauté for a few seconds in a medium heat. Add tomatoes, carrot and sauté for a minute. Add mashed potato, chili powder and sauté it. Cook for 1-2 minutes, add salt, sauté it and turn off the stove. Coat the bread with ghee uniformly on both sides, apply a thick layer of prepared stuffing on a piece of bread and level the stuffing. Cover it with other piece of plain bread coated with ghee, gently press it and place it on a heated non-stick frying pan. Wait for half a minute or until bread becomes golden brown in color. Flip over carefully don’t knock out the stuffing inside the bread slices and toast the other side.  Serve with tomato sauce. Inside of bread slices can be coated with tomato sauce after applying ghee(optional).  Serve warm.  Spice lovers can spice up stuffing with green chillies/chat masala.